Ace energy is the distribution arm of the group delivering solid fuel, bottled gas and air products compressed gasses. 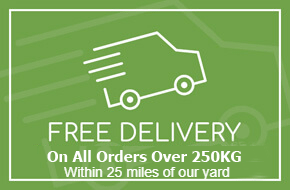 We deliver products seven days a week in Halifax, Leeds, Huddersfield, Bradford, Keighley, Skipton and Ripon and the surrounding areas. As a small family run coal business we endeavour to sell all our coal and smokeless fuel products in as clean and dry condition as is possible, so much so we have purchased a state of the art screening and bagging plant that removes fines from our products. To make sure all our products are kept as dry as possible we have spent in excess of £2,000,000 on a building to cover the coal yard, bagging plant and storage facility for 8000 tonnes of fuel. The benefits of covering our coal and smokeless products is: some smokeless fuels can potentially contain in excess of 20% moisture, because our fuels are kept undercover they do not suffer from the ingress of water so there is the potential to get a considerable amount of extra volume per delivery because the fuel is clean and dry.